Messages in iOS 10 opens to developers for the first time. That's major. Apple’s big changes to Messages in iOS 10 seem mostly cosmetic: Giant emoji, full-screen fireworks, handwritten scrawls across photos and videos, and stickers galore. These are features lifted straight from Facebook Messenger, Snapchat, Line, and all the other messaging apps that are resonating with teenagers and, even if they won’t admit it, their parents. But the biggest change to Messages is more behind the scenes. Facebook Messenger and WeChat are taking over the world, but Apple’s decision to open up iMessage to developers makes it clear that the company isn’t yielding to the dominant messaging apps—in fact, it has an advantage. Apple’s iOS 10 demo at last week’s Worldwide Developers Conference keynote was full of brand-new features, but Craig Federighi, Apple’s senior vice president of software engineering, devoted a large chunk of time to changes coming to the Messages app. If you’ve used any other messaging app in the last few years, most of the flair coming to Messages looks more than a little familiar. iOS 10 gives Messages some signature Apple style, like an invisible ink feature that blurs your photos and texts and has to be swiped away, but the improvements are familiar. But Apple’s decision to turn iMessage into a platform is more significant than all the Snapchat-like effects that have garnered the lion’s share of attention, because third-party apps can now be used to enrich your messages without ever leaving the Messages app. It’s the Facebook Messenger approach, but more refined. The new iMessage software development kit allows developers to build extensions that bring their app experiences directly into Messages. In iOS 10, you can access third-party messaging apps from the iMessage App drawer. Just tap on the App icon next to the blank text field to find apps and create content that you can share straightforwardly in-app. Finding Dory stickers are just the beginning. 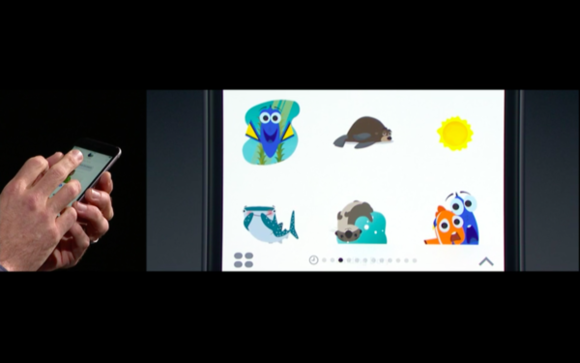 Federighi used a funny image creation app called JibJab to demonstrate the features in his WWDC demo. JibJab lets you create and share e-cards with people, and the iMessage extension allows you to select from a gallery of faces in your Camera Roll and drop a friend’s face on a JibJab GIF. When you share that image with someone, it will appear in the same iMessage conversation with a button beneath the image to install JibJab. Whereas Facebook Messenger would kick you to the App Store to finish downloading the app, in iMessage, you’ll remain inside your conversation. JibJab will appear in the new iMessage app drawer, which you can open without ever leaving Messages. That seamless installation process is huge for developers, JibJab cofounder and CEO Gregg Spiridellis told me. App discovery in Facebook Messenger: If you send someone a JibJab or Bitmoji, that person is also prompted to install the app into the Facebook Messenger platform. Facebook also used JibJab to demonstrate their Messenger app platform at F8 in 2015. Spiridellis said JibJab is platform-agnostic, but Apple has a clear advantage because its tools are built in at the OS level. Apple isn’t really trying to compete with Facebook Messenger or Snapchat or any other messaging app, and it doesn’t need to. Addictive apps keep people using their iPhones. But Apple’s newly open iMessage platform has the potential to turn Messages into a universal hub for more than just messaging. A cautiously open iMessage platform could herald a centralized app where you not only send messages with stickers and giant emoji, but also use Apple Pay to transfer money to friends and shop from brands. The Siri SDK launched at WWDC might signal the onslaught of iMessage chatbots. OK, those days are a ways off, if they’re coming at all, but Apple is clearly taking cues from Facebook Messenger and apps like WeChat, which is popular in Asia. Stickers and GIFs are cute and all, but Facebook Messenger also has useful third-party integrations, like ordering an Uber right inside the app. Facebook’s stand-alone messaging app has more than 900 million monthly active users sending messages, stickers, money, and more without ever leaving the app. 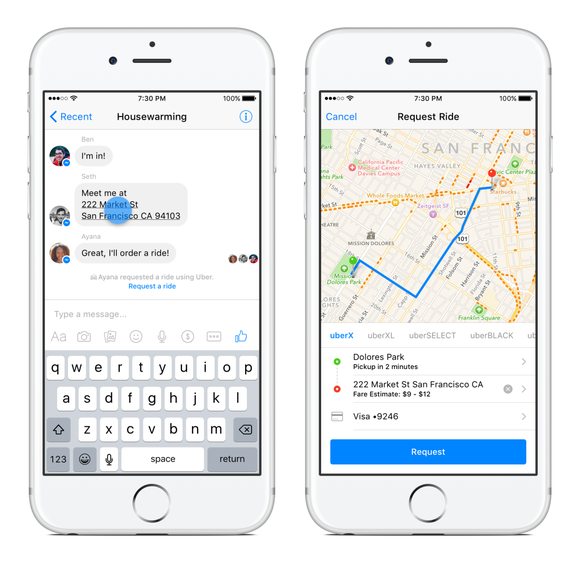 Some of that functionality is enabled using other apps that are plugged into the Messenger platform, which launched last year. Tencent’s WeChat has more than 700 million monthly active users, mainly in China, which is where Apple wants to dominate, and is also a platform for third-party developers. It’s unclear exactly how many people use the Messages app, though Federighi said during the WWDC keynote that it’s the most frequently used app on iOS. Given that Apple has a base of more than a billion active devices, it’s safe to say a good chunk of them still use iMessage or send SMS messages through the Messages app, even if they use over-the-top apps like Facebook Messenger or WeChat, too. Tech entrepreneur Matt Galligan, who founded the now-defunct news app Circa, wrote a widely circulated blog post last year envisioning what iMessage as a platform would look like. 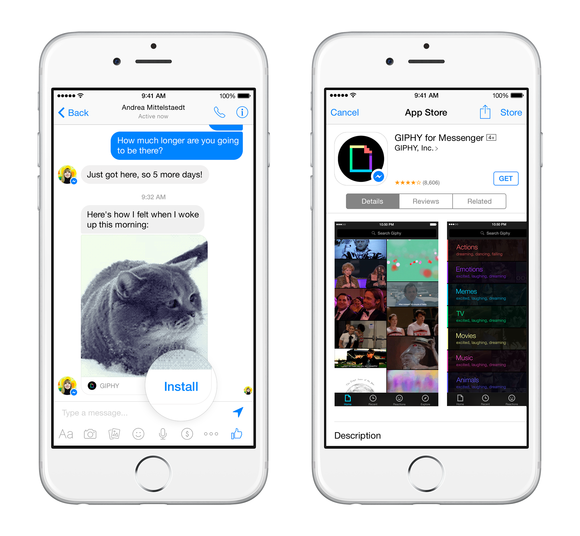 Many of the features he dreamed up came to life in Facebook Messenger, but are even more relevant and seem more possible now that iMessage has actually become a platform—limited, to be sure, but a platform all the same. Apple won’t bring iMessage to Android, which will limit its capabilities. Facebook Messenger and WeChat can reach more users. But if iMessage will ever become a hub, it’s a safe bet that Apple will secure it with hardware integration that no other messaging platform is capable of. “The children of tomorrow will have no understanding of the English language,” Federighi joked as he blazed through the host of novelties coming to iMessage. Some of those visual changes aren’t popular with people who want a bare-bones messaging app. But if Apple can please the next generation of iPhone owners with gratuitous messaging tricks, they could become the Apple service users of tomorrow. And, as we all know, the future of Apple is services—or so the company hopes.